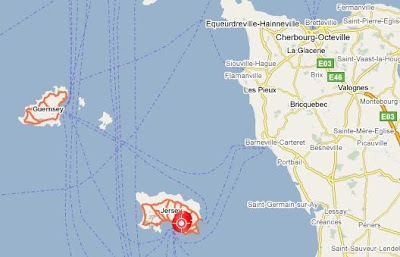 Above: The route from Jersey to France - La Coupe Point to San Germaine Sur Plage, 18 miles as the crow flies. Following last years swim being cancelled due to the adverse weather conditions, my first swim which is definitely booked for 2009 is to attempt the swim from Jersey to France, booked for the week commencing July 01, 2009. Jersey is a beautiful island and despite the fact I did not get to swim, we spent a great week there in what were very sunny and warm conditions, even though it was too windy to swim. Above: My coach (and wife!) celebrated her birthday on August 11, 2008 in the very tropical island of Jersey. Above: With Vice President of the Jersey Long Distance Swimming Club and my pilot, Charlie Gravett during our very windy trip around the island by car. Above: View across the sea on the north of the island which clearly shows the windy conditions out at sea which made the swim impossible last year. Above: I completed two training sessions in the beautiful St Catherine's bay (as well as a session in the pool and in the sea at another part of the island). This is quite close to the starting point of the swim. One very good thing about going over to Jersey last year from a swimming point of view, was that I saw the starting point of the swim, and looked across to see France. I always find this very important preparing for a swim to be able to visualise the swim, over and over again in my head months before it happens. Above: La Coupe Point to San Germaine Sur Plage, the starting point for a Jersey to France swim. Above: Gazing across the sea to France. If you look closely, it can be seen on the horizon quite clearly. I am really looking forward to this swim and hopefully the weather will not scupper it again this year. All my training is geared up for this swim, and although I am preparing another two swims as I write, we have a family issue which may take precedent over swimming this year. Will keep you informed!